It's been a while since we've seen Will Smith on the big screen, and even longer since we've seen Agent J. 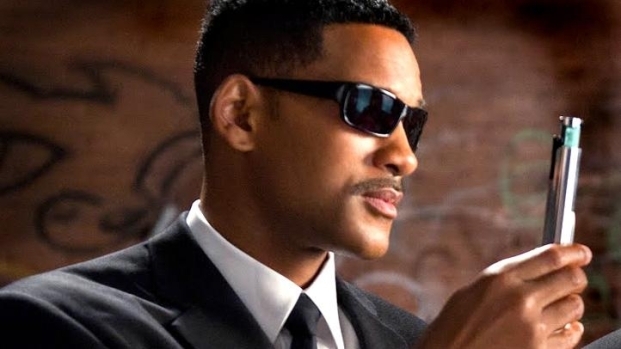 Not only is "Men in Black 3" the actor's first movie in three years, but it comes 10 years since "MIB2." In the recent past, Smith has focused on helping his two young kids make hit films and records and has had to cope with some unpleasant press. With "MIB3" out this weekend, one might wonder just how bankable and popular Smith remains, and more to the point, is there an audience for this movie? Smith's transition from rap star to TV star to movie star got a big boost from two sci-fi films, 1996's "Independence Day" and 1997's "Men in Black," movies that were part of the post-Cold War alien invaders boom. With the age of the evil Ruskies behind us, Hollywood began looking evermore skyward for villains, and Smith was savvy enough to get on board. Those two films combined to make more than $550 million and established him as a global superstar. Alice Eve Talks Filming "Men in Black III"
Alice Eve chats at a press junket for "The Raven" about working with Will Smith and Josh Brolin on "Men in Black III." What was it like on set, and how did Will Smith keep everyone motivated? Garrett Quinn, a Boston-based political reporter and self-described cinephile, was 13 when "MIB" came out, and it blew his tween mind. "The first Men In Black was awesome because it didn't take itself seriously. It was a perfect comedy/sci-fi hybrid. I'm not sure that style of comedy will still fly 15 years later. It was a very late 90s flick," said Quinn. Five years after "MIB," we got "MIB2," a lifeless sequel that most everyone hated and that saw a 40% drop in box office, when adjusted for inflation. Grae Drake, a movie critic at Fandango recently watched "MIB2" again, and the passage of time has done it no favors. It's been 15 years since the first "Men In Black" movie hit the screens. Extra-terrestrial busters Will Smith and Tommy Lee Jones will be back in black suits and Ray-bans when Men in Black III arrives in theaters May 25. Smith talks about the return of the famous movie franchise. 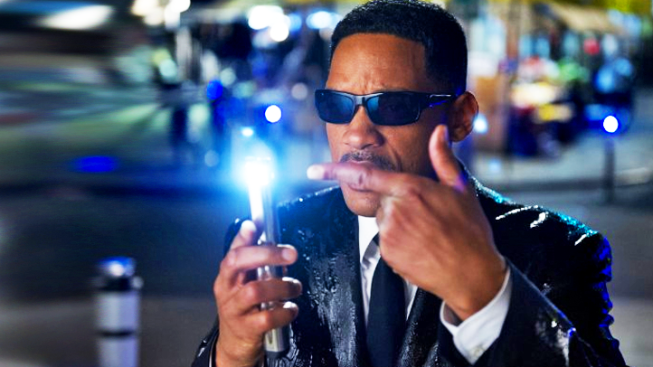 "'Men in Black 2' is actually so bad that we all want to neutralize it from our memory—it's horrendous… I think that they just didn’t have enough of a new story. It's perfect Hollywood sequel-itis. I just revisited it, and between you and me and everyone else, I had to fast-forward." Now comes "MIB3," and expectations for the film have been dogged by some bad publicity surrounding the production of the film. They started shooting before the script was done, filming was then suspended for months while the script was finished, and Will Smith's Titanic-sized trailer infuriated locals seemingly everywhere it went. As fond as his memories of the original are, Quinn's unsure about this latest chapter. "It's a movie you probably should see in a theater with a giant screen and surround sound and a bunch of strangers, but I'm not sure I want to part with a few bucks to see it. Do I really want to see the same jokes with only moderately better special effects? The Josh Brolin character is intriguing and 'oh they go back in time' seems interesting, but not sure I'd spend money on it. Maybe on Blu-Ray." While the fears are understandable, "MIB3" is that rare three-quel that exceeds its predecessor, overcoming a slow start to find its footing, and Brolin is brilliant as a young Tommy Lee Jones. "I think that in the 10 years that have passed since 'Men in Black 2,' what they did is finally get distance enough to tell a slightly different story," says Drake. "This is where Hollywood sequels really succeed—when they spend enough time with a writer, that they are able to do something new enough that you learn something new about your favorite characters. This is something that Christopher Nolan has capitalized on in 'Batman.'" Though you might think the long layoff would have chipped away at Smith's star power, incredibly, he's even more recognizable now than he was at before the release of his last two films, "Seven Pounds" and "Hancock" (which "were not good," to quote Drake). According to his Q scores in early 2008, 83% of those surveyed knew who Smith was, and of those folks, 46% considered him to be among their favorite celebrities. This past winter, those numbers stood at 90% and 41%--and even if that second number is down, it’s still good enough to rank him among the best-liked celebrities. And that 41% Q score is actually pretty awesome considering that a lot of the press during Smith's hiatus has questioned his personal life: For example, the actor and his wife Jada Pinkett-Smith came under fire from writer Terry McMillan, who said they had "pimped" their kids (she later apologized) and rumors their marriage has been on the rocks continue to pop up. The couple has repeatedly denied having any major problems, with Pinkett-Smith recently calling it "ridiculous." Ironically, Courtney Hazlett, celebrity reporter for MSNBC's The Scoop, thinks these whispers have been helping keep Smith afloat. "If anything, they might have helped him—if not for those whispers, all we'd be looking at is what his kids are doing and saying," she says. Hazlett, however, believes that if "MIB3" doesn’t perform well this weekend, Smith could find himself further emulating the "Mission: Impossible" star. "Will Smith is in danger of becoming Tom Cruise post-couch. I believe if this next movie isn’t huge hit, that's where we are," said Hazlett, referring to Cruise's famous moment jumping on the couch "Oprah" in 2005. "Things like slapping reporters… That's the kind of thing, there's just no tolerance for that anymore. Behaving badly is attention grabbing, but I think it really begins to break down that important barrier between person and actor." The decade-long span between "MIB2" and "MIB3" is all but unheard of, as only two other three-quels have come out after such a long wait, "Toy Story 3" and "Terminator 3." The former is arguably the greatest three-quel of all time, the latter was a huge disappointment--who knows where on that spectrum "MIB3" will land. Despite the high stakes and long odds, Hal Vogel, CEO of Vogel Capital Management and author of "Entertainment Industry Economics," thinks "MIB3" has a shot at being a success. "MIB3 would likely need to do about $750mm worldwide... In my opinion, it has that type of potential, but there's no way to easily predict what will happen," said Vogel via email. "In my opinion, this one is a reasonable bet, all things considered, but the risk is fairly high that it won't measure up to expectations for return on investment. The competition for screens and audience attention in this peak film season is fierce." Drake seems confident that Smith and his new film can again win over fans. "Ten years after the last film, this is the sequel nobody wanted to see, but it does have enough buzz surrounding it, and it is a fun summer movie. Battleship made $25 million last weekend, and I think 'Men in Black 3' is an infinitely better film."